Brasserie Forty 4 Is this your restaurant? Me and my family enjoyed a fantastic evening at Brasserie Forty Four. The staff were pleasant, professional and welcoming. The atmosphere was warm and inviting. I was very pleased I requested a window seat because the river view was just lovely. The food was delicious and cooked just right. My lamb rump was so moist and tender. Will definitely be returning! I wanted a special restaurant for mine and my girlfriend's two year anniversary as we don't usually go to fancy places - a nice change! As soon as we walked in we were served and the staff were very observant. I had the sirloin steak which was cooked perfectly, and my girlfriend had the lamb rump. Both were very flavoursome and delicious. We shared a side of chips between us - there weren't very many but they tasted great! Probably won't be going back anytime soon but for a special occasion it's a perfect choice. 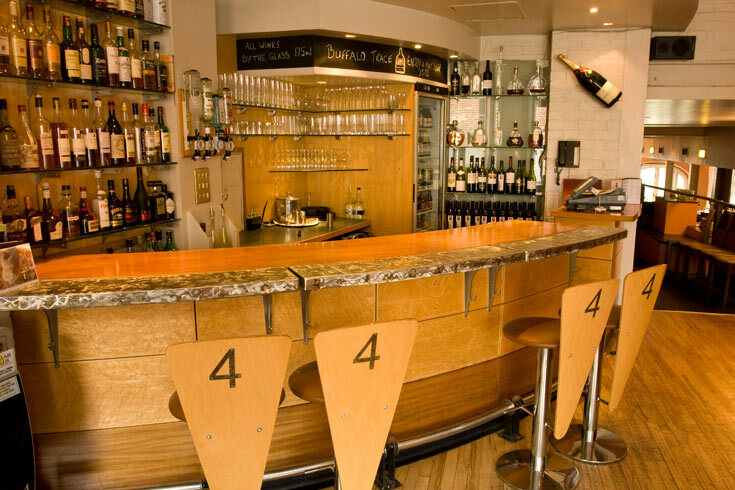 Was visiting Leeds over the weekend and decided to book a meal at Brasserie Forty 4 due to a friend's recommendation. I was feeling especially peckish on this particular evening so was very happy to find myself tucking into a generous portion of juicy steak! It was really to die for. Top notch service! I absolutely love this place - lovely atmosphere, excellent quality food and very helpful waiters. As it was fairly sunny we were seated on the balcony and it made it even more special. I had the roast chicken which was delicious. 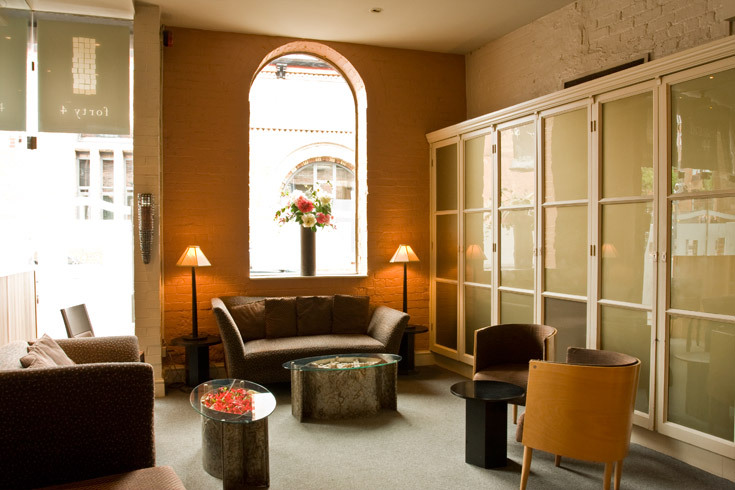 I can't wait to come back here, Brasserie Forty 4 is the perfect place for a special occasion. I had the lamb rump steak from Brasserie Forty 4 and it was lovely. My girlfriend had the vanilla creme brulee for dessert and said it was the best she'd had. We would definitely go back, helpful service too. Great service and top quality food at Brasserie Forty 4, as well as very helpful staff who were eager and quick to help. Overall atmosphere was also good - would eat here again. The food was delicious although I would have preferred to be offered a side order with my meal, and even when i asked what it came with I wasn't told that there would be no vegetables or potatoes so I'm glad I did order side orders! We went on a Tuesday lunch time so we were the only people in there but the setting is beautiful, we were sat right in front of the waterfront and it was a beautiful day. 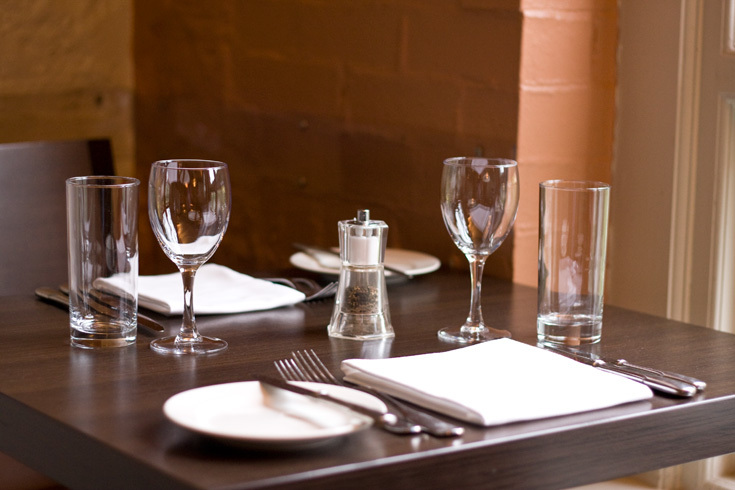 The waiter who served us was very friendly and accommodating and I feel the food is very good value for money. Excellent meal in a lovely setting, served by very friendly staff. I am looking forward to returning soon. Lovely meal and excellent service, the staff where very helpful and will definitely go again! 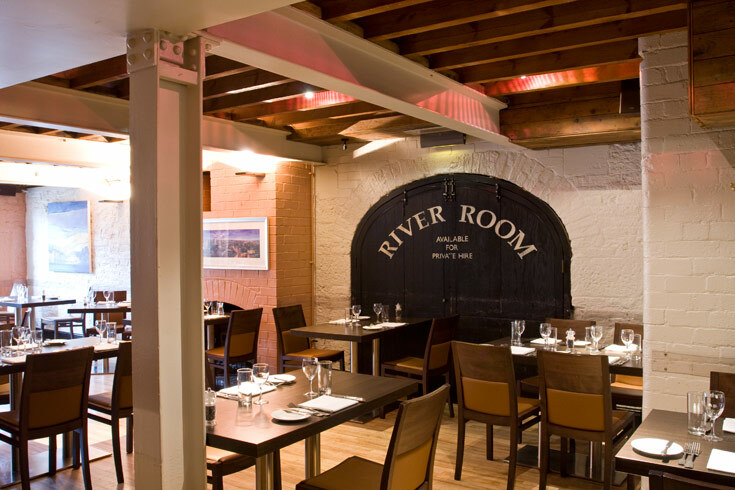 Service was very pleasant, nice table and food very good, price was acceptable for a city centre restaurant and it included a bottle of wine between 2 people. Will definitely book to go again. We really had a lovely time. We went for an early meal and started with a cocktail. The 3 course meal was beautiful, everything was cooked to perfection. Service was attentive and friendly. It is expensive but worth every penny. A great place to go for a celebration dinner. We will be going back. Surprised my partner by booking the Jaguar pick-up service! He loved it! The food here is absolutely delicious and the staff are very pleasant. Overall we both feel very well looked after and will be returning again. Took full advantage of the 25% lunch special offer. The hosts were very knowledgable of the food they were serving and helped us in food choices. We were also picked up in the jaguar which was a lovely extra touch. All in all, service and hosts were fantastic and the food matched this. 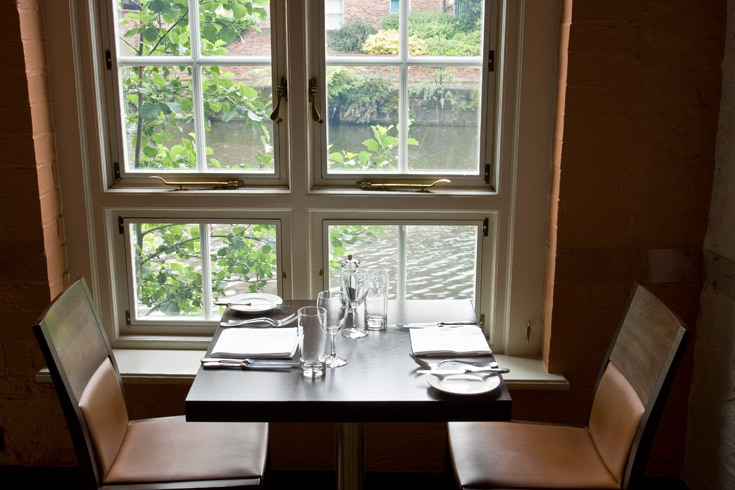 Situated on the riverside in the centre of Leeds, Brasserie Forty 4 is an independent, family-run restaurant that acts as a haven for those looking to escape the hustle and bustle of the busy city streets. 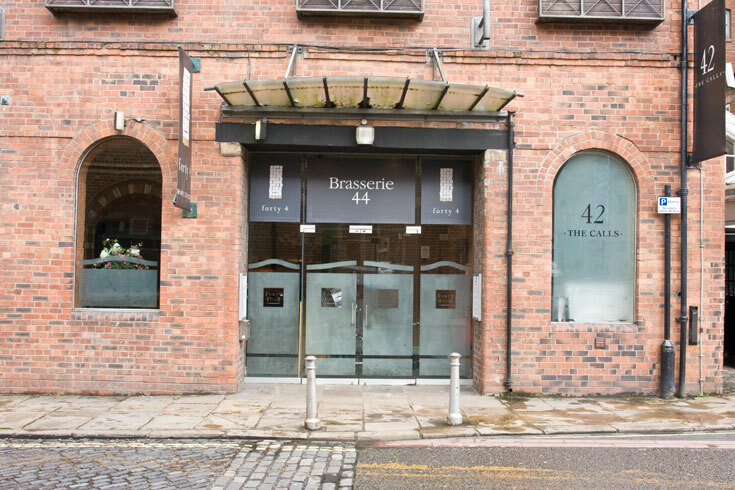 Housed within a beautiful converted grain house that the restaurant shares with hotel 42 The Calls, Brasserie Forty 4 is full of character and decorated in a contemporary style. The original features such as the large arched windows, iron and wood beams are complemented and accentuated by the neutral colour scheme and unfussy décor. 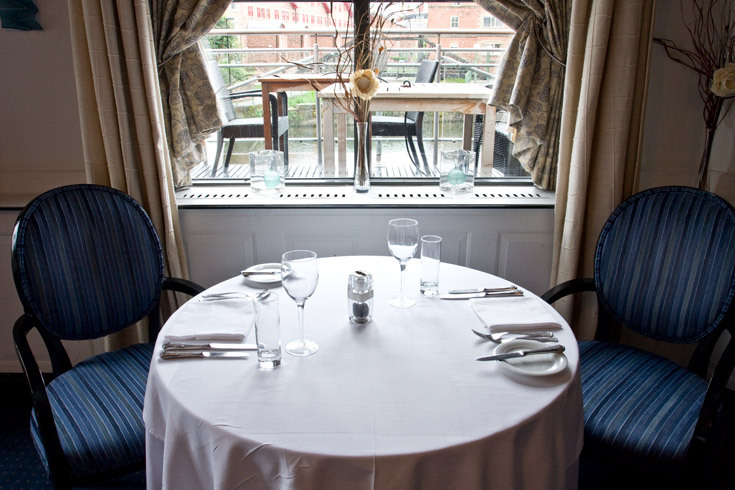 A small but perfectly formed al fresco balcony that is raised above the river is the perfect spot to watch the sun go down with a drink or two, weather permitting of course. Whatever time of day you decide to visit Brasserie Forty 4, the kitchen team never make any compromises when it comes to the quality of the produce used or the time and effort that is put in to make every mouthful absolutely delicious. From the fresh-baked breads to the biscuits served with your coffee after a delicious meal, everything is home-made making dining here a real treat. The lunch menu is perfect for business meetings or a satisfying meal to break up a hard days shopping in Leeds city centre, and if walking isn’t your thing Brasserie Forty 4 will pick you up in style for free, in a Jaguar XF! In the evenings, the Brasserie comes to live and transforms from a relaxing day spot to a buzzy bar and restaurant filled with laughter, conversation and all of the aromas of a working kitchen. You can start off early evenings with the Early Bird menu which is very reasonably priced and includes a bottle of wine to share between two people. 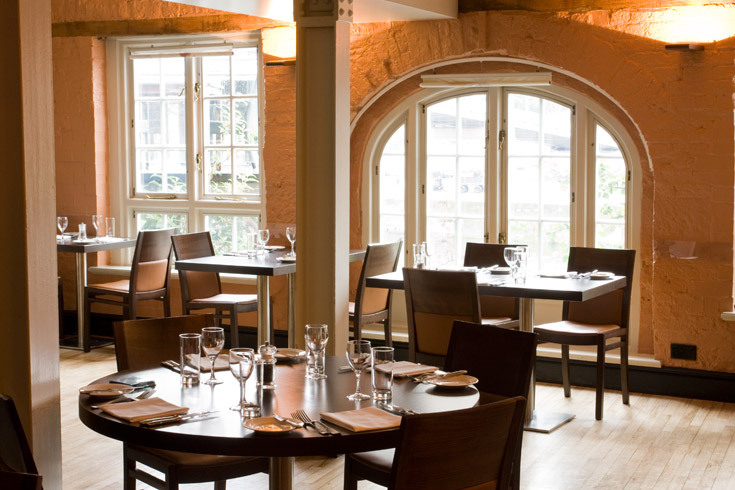 The a la carte menu showcases the very best local produce including lamb rump served with redcurrant jelly and pearl barley; confit leg of duck with butter beans, bacon and a red wine sauce; and roast chicken breast with buttered spinach, parmesan dumplings and a thyme jus. 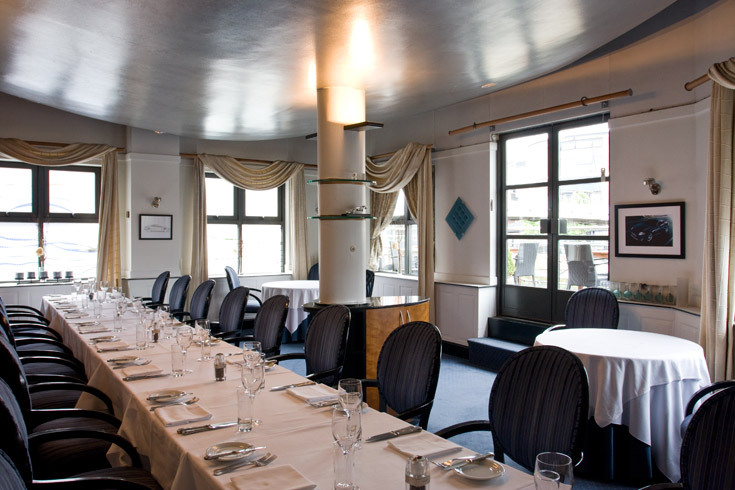 Offering fine food and excellent service in relaxing surroundings, Brasserie Forty 4 cannot be recommended highly enough. The fantastic reviews speak for themselves and we guarantee you will not be disappointed.